Well guarded secrets have been protected by the sword for centuries and so does nature sometimes with her treasures in many ways. 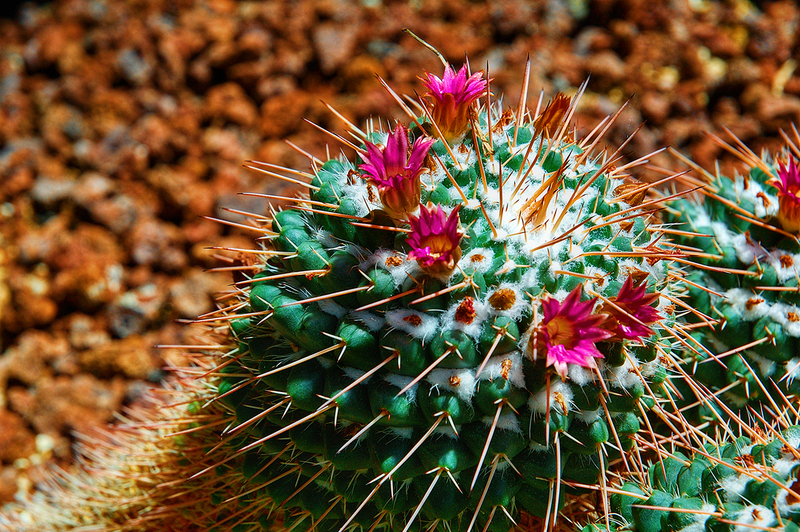 These small flowers perhaps are meant to carry the fruit of this cactus in the long run so they are better kept somewhere safe among these deterrent daggers. Only insects allowed. Two interesting links I stumbled upon today: Sidewalk Chalk Guy and Lost Cities. Thank you especially for the link of " lost cities"! I am quite fond of the ancient world! Interesting picture of the cactus. I did write about how people used to wear long underwear over winter or until we began to stink. You can find the link at the bottom of the post today. A ver quien es el listo que coge esa flor si no... por cierto, antes se me olvidó comentarte, ultimamente descubro un montón de estatuas esculturas interesantes por Madrid. Conoces la del Ángel Caído? tal vez pasaste por delante de ella cuando paseabas por el Retiro y no te fijaste.. dicen que es el único monumento dedicado a Lucifer en todo el mundo... qué yuyu. Thanks Leena, Abraham and Dsole. Dsole no te lo creeras pero si tengo el angel caído. De aki a un rato lo pongo en Flickr pa ke veas que si estuve en Madrid. Un amigo me explico que era la única en el mundo, sí. Me extraño, pues lo oculto es un tema fascinante, aun no siendo satánico.